Here at The DIY Joint, located in lovely Hoboken, NJ, we provide you with the skills, tools, and space to make something awesome with your hands and mind. And while you may have found this page or site by typing into your smartphone something to the effect of “woodworking class near me” or “local woodworking class NYC”, we want you to understand that we want to give people much more than just a rudimentary understanding of carpentry and a few woodworking tools. We are passionate about what we do here. Empowering and challenging people to get out of their comfort zones and make something with their bare hands, often an intimidating prospect, is what makes us all of us at The DIY Joint excited about the next NJ woodworking class we will be teaching. Our woodworking classes in NYC include an Introduction to Furniture Making, Milling Lumber Cutting Board, making an Engraved Keepsake Box, an Open Studio Certification (so you can independently use our woodworking space), a DIY Wine Rack class, Utensil Shaping, and more! You even have the option to take a private class or a group one! All in all, we want people from a variety of backgrounds and skill levels to learn more about us at The DIY Joint, because it doesn’t matter what kind of experience you bring to the table – what matters is your learning about yourself while experiencing the satisfaction of making something with your bare hands. That is something we have lost as a society in the age of digitization…but don’t get us started on that topic; we would be here writing all day! We have a promised topic to get to, so keep reading if you are interested in a look into the rich history of ancient woodworking, starting at ancient times! The modern definition of woodworking involves the act, process, or occupation of working wood into a useful or desired form. While ancient civilizations likely didn’t have that technical of a definition, their applications still fall under that modern concept’s umbrella. Woodworking and its applications have varied from ornate artwork to pragmatic shelter. If you are a woodworker, or are just starting to get interested in the craft, wouldn’t you like to have a basic understanding of its origins? The Hebrew Torah and Christian Bible contain the story of Noah’s Ark. Some might be familiar with the massive flood, about which God foretold Noah, so that he could save his family along with a host of animals that would be coming on board. To do this, Noah received explicit instructions. As a woodworker, you might appreciate the attention to detail. The ark’s plan stated it was to be 300 cubits long (a cubit is roughly 18 inches, or the length of the then-king’s finger tip to his elbow, in case you were wondering), 50 cubits wide, and 30 cubits high. This works out to be roughly the size of a four-story building. If anything of this sort was actually constructed, we would imagine it would take the help of more than Noah and his three sons. And we aren’t here to debate the veracity of the Biblical account, but to simply admire the undertaking of such a woodworking project! 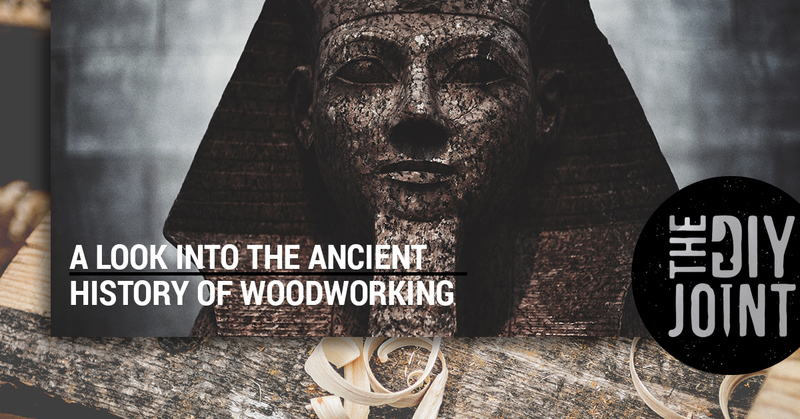 Dating back earlier than 3000 B.C., ancient Egypt utilized woodworking in fascinating ways. They crafted coffins from wood, for starters. But they are also said to be the first people who varnished – or finished – their woodwork, although no one alive knows exactly how they did this. The culture also developed mortise and tenon joints to join timber together. This is the earliest example of joinery that we have on record. Additionally, Egyptian woodworkers used bow saws, pull saws, chisels, Adzes, and axes to perform their woodwork. Many pharaohs were buried with a collection of ornate objects, some of which were preserved through the years, that had ivory inlays and ebony finishes. Perhaps the most famous example of preserved ancient Egyptian woodwork can be found in the Khufu ship, a famous craft which was dug up and recovered near the Great Pyramid of Giza. It happens to be one of the very oldest ships that are around today. Fast-forward a few thousand years to the year 720 B.C., and you have the era in which we’ve determined that the ancient Chinese civilization began to harness the power of woodworking. Their advanced applications of woodworking included extreme precision (for that era), which they utilized to make tables, pots, and other pieces of furniture. To this day, Asian traditions have maintained a dedication and pride for their ability to practice woodworking and joinery without the use of electric equipment. To this day, this tradition is maintained in Japan and other areas of the East. One of the most famous Chinese carpenters of this era was Lu Ban. As one of the predominant influencers of early woodworking in China, his advances in the craft included bringing the chalk line, plan, and other such tools to the region. In his book, Lu Ban Jing, the “Manuscript of Lu Ban”, Lu Ban offers his readers detailed descriptions and dimensions for objects he fashioned. Some of these included tables, altars, and flower pots. From roughly 700 B.C. to 500 AD, the Romans utilized woodworking and carpentry concepts to help develop their massive empire which stretched from Britannia to modern day India. A distinguishing feature of Roman woodwork was to carve faces of animals, some of which were myths and idols, into their wood projects. What’s more, Rome was something of a war machine. They used their sophisticated understanding of joinery and carpentry to produce fleets of warships and siege weaponry, like trebuchets, battering rams and catapults. While the Roman Empire wasn’t the first to have such applications, they were certainly efficient in their use. So, you’ve read how the ancients did it. Are you inspired? Even if reading about war machines and Egyptian coffins isn’t quite enough to get your creative juices flowing, we encourage you to learn more about The DIY Joint and our woodworking courses in NJ. We have a shared workspace, pro-grade tools and equipment we train you how to use, and have a range of class types that are fit for any skill level. If you are interested in giving yourself or a loved one a gift soon, consider giving them the gift of self-discovery and expression. So many of our class participants talk about how proud they are to be able to create something tangible with their hands. Throw in the ability to give your creation as a gift (or keep it and use it, we don’t discriminate! ), and you can understand why our woodworking classes are getting so popular. Sign up today while you can!